The Buffalo students responded. By September, they had subscribed over $1,000 for a University of Buffalo football team. But athletic endeavors at U.B. had never been profitable over the years. Since U.B. did not have a field of its own, practice time had to be rented on the privately owned Buffalo Athletic Field. Plus 30% of all the U.B. home game gross receipts went directly to the owners of the Buffalo Athletic Field leaving little for the team. In 1904, the U.B. faculty would not consent to make up any financial deficits the team might incur. Ultimately, due mostly to financial reasons, the 1904 Buffalo team and season did not materialize. In December of 1904, Dr. Burton T. Simpson of the U.B. medical department (who played football for U.B. in 1899, 1900 & 1901) took up the cause and presented a paper to the U.B. faculty extolling the virtues of college athletics and football specifically. It was hoped that his paper, entitled the “Consideration of the Advisability of Athletics in Professional Colleges, with Special Reference to the University of Buffalo” would be the first step towards the establishment of a properly funded football team for the University of Buffalo. The paper was later published in the Buffalo Medical Journal (Volume 60, 435-444). Unfortunately the vote was symbolic in nature only and carried no weight. Although it seemed that the return on U.B. athletics was eminent, the reality proved otherwise. It would be over 10 years before Buffalo would officially support any type of college athletics; the longest period of inactivity in school history. Dr. Huver, Graduate Manager of U. of B. Athletics, Has Arrangements Pending With Yale, Bucknell and Lafayette. Students of the University of Buffalo received a heart to heart talk on football by a representative of the faculty committee on athletics. It was stated that if support and loyalty were shown that the Buffalo University would have a team able to cope with the leading colleges of the country. Each and every student was urged to accord their financial aid by buying a season ticket. Dr. Huver, who is one of the varsity’s mainstays in football, has been appointed graduate manager and the doctor has booked games with Cornell and Syracuse and has answers pending from Yale, Bucknell, Lafayette and other leading colleges. Bemus Pierce, the great Carlisle player, reputed to be the only man able to play against the mighty McCracken of the U. of P. 1898 team, will probably be selected as head coach. Pierce was Buffalo’s coach three years ago when an excellent eleven was turned out. Dr. Simpson Tells U. of B. Professors That Athletics, and Particularly Football, Will Add to Fame of the Institution. A paper of unusual interest was read yesterday afternoon by Dr. Burton T. Simpson of the medical department of the University of Buffalo before the faculty of the university at the medical college in High Street. Dr. Simpson’s subject was the “Advisability of Athletics in Professional Colleges, with Special Reference to the University of Buffalo.” It is the first step looking toward the establishment on business lines and under definite responsible management of a football team for the University of Buffalo. Dr. Simpson’s paper opened with an unequivocal declaration in favor of college athletics, especially football. He considered athletics as to their value to the institution and their value to the students. He showed what other colleges were doing in the way of athletics, 146 having football teams, 53 being purely technical colleges, of which 12 are medical institutions. In the preparation of his paper Dr. Simpson communicated with the presidents of nearly every large college in the country with the idea of securing their views on the advantages or disadvantages of football and their personal opinions of the game. He received 16 replies, 13 of which declared athletics, and especially football, to be beneficial to the students participating and to the student body as a whole. The remaining three were negative. The benefits to the university were advertising: a better standing with the people of a university city reflected through the students and the personal interest shown by newspapers in the work of students who were on the teams. Illustrative of this, Dr. Simpson referred to the U. of B.-Columbia game, where Buffalo defeated Columbia by a score of 5 to 0, by a goal from the field. The student who made the kick was a pharmacy student. The newspapers in his home town gave columns to the game’s report and the student’s kick. These reports, if they did nothing else, told the public that there was a University of Buffalo, that there was a college of pharmacy, that there was a football team, and that it was then superior to Columbia’s. College men talk about their athletes; newspapers give much space to college games, which as a news feature take precedence over everything else, as a rule, and the public shows a deep interest in the results. Just how popular football is was shown by the fact that there were 57 teams playing in Buffalo this year, taking in 700 players. As to the value of football to the players, the general sentiment is best expressed in the president’s report issued by Cornell, in which it is stated that “College games beget in a young man promptitude, quickness, self-reliance, self-control, co-operation and surrender to authority.” The headmaster at Harlowe has declared that England owes her empire more to sports than to studies, while the professor of mathematics at Yale declares football to be the best form of sport; that no other sport is so beneficial to the body and mind, and that its moral effects are courage, self-control, self-denial and obedience and discipline. Dr. Simpson showed that football consumed but two hours a day for the first two months of the college year, this applying to only twenty men, the players and subs. Combating the argument that a student engaged in technical study could not or should not play football, Dr. Simpson called attention to the fact that Pennsylvania’s captain is a medical student; that Cornell’s captain is an electric engineer; that last year the Michigan team had among its members four mechanical engineers and six law students, all of whose averages in study were high. Dr Simpson has coached the Masten Park High School team for several years and during that time has never dropped a player for study shortcomings in spite of the fact that players were required to make and maintain a percentage of 80 percent, in their studies. Regarding accidents, in the fourteen years he has been connected with athletes. Dr. Simpson has seen only five serious accidents, a broken collar bone, three broken legs and one broken rib. As nearly as he could gather the statistics he found there were 48,000 young men playing football the past season. Of these only 121 were injured. 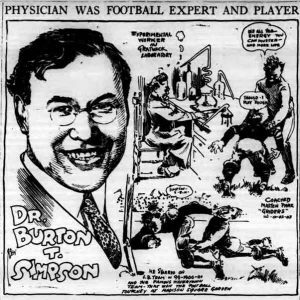 Dr. Simpson then gave a very comprehensive idea of the game and its requirements; he said if football were reintroduced at the University of Buffalo faculty interest in the games was necessary to the success of the team; the members of the faculties should attend the games; if a team is organized it should be a good one, or there should not be any at all; and he showed how football would benefit the whole student body by providing money enough to fit up a gymnasium and baths from the proceeds of the games. In time the university could have an athletic field of its own. After the paper had been discussed an informal vote was taken. Twenty-nine voted in favor of university athletics and only four against.